– a chart that students might place in their homework/classroom folders with realistic, dual-sided pictures of each coin, coin values, a chant for each coin, and the placement of the dots that will aid them in counting the coins. This method will work for the vast majority of your students. Don’t worry about them relying on the dots. With time, they will begin to chunk larger values together until they are counting coins in a more traditional way. 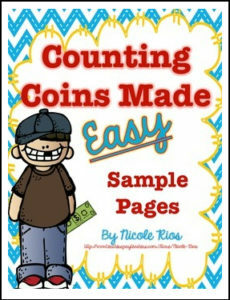 If you find this download helpful, this product is part of a larger download “Counting Coins Made Easy with Differentiated Materials” that you can find HERE. I also offer an ActivInspire flipchart to accompany these learning materials HERE.